If you feel stuck for time, this is a great toddler activity that your child can do whist you cook dinner! I simply put a handful of three different types of pasta into a bowl and gave her three containers to sort it into. 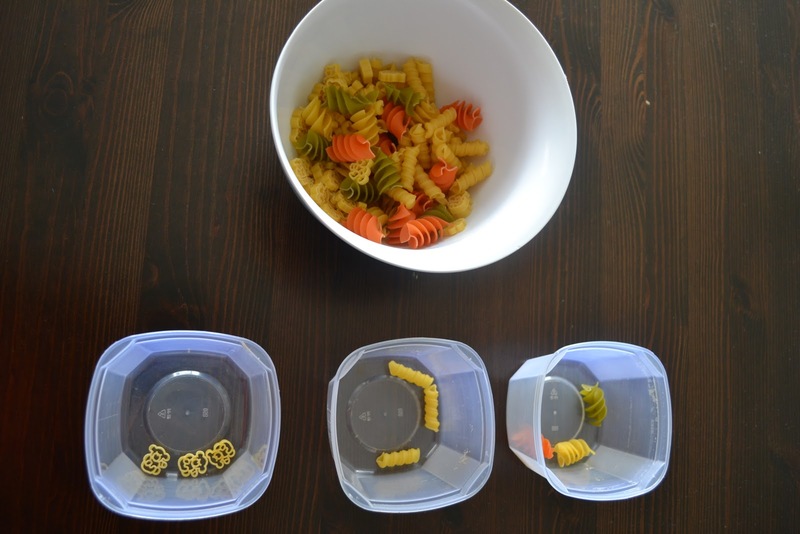 Put a bit of each type of pasta into the containers, so they get the idea, and let them sort out the bowl! For an older toddler, give them a pair of mini tongs to use for transferring the pasta; it really helps with their fine motor skills. After a while, Eden decided she had sorted the pasta enough, and it turned into a pouring game. I went with it, and added a jug, a measuring cup and spoon and a plastic bowl. She loved it, and so did I (not a toy in sight = happy mummy)!